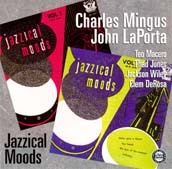 1-4: Period SPL-1107 as "Jazzical Moods, vol. 1"
5-7: Period SPL-1111 as "Jazzical Moods, vol. 2"
On 'Four Hands' Mingus plays bass and piano simultaneously by overdubbing; on other tracks both instruments are used alternately (Priestley). 'Abstractions' was also released on a Period various artists compilation "Jazz Digest" (Period SPL 302).